Monorail track lighting provides a number of advantages. First, it allows the ability to choose smaller lighting elements. Also, most monorail track lighting is low- voltage so there is the opportunity to save energy by using halogen lamps that give more light per watt than incandescent light bulbs. They are also extremely flexible so elements can be moved or added in the future. This gives you the ability to customize your own lighting system by adjusting height, determining length of rail and capability of bending and shaping rail. Finally, the use of monorail track lighting can create a functional lighting system using directional heads and striking glass pendants to go over counters or tables. Track lighting provides general, task, or accent lighting all at once in one flexible lighting system. You can move, swivel, rotate, and aim the individual light fixtures in any direction along the track, giving you the versatility to change your lighting scheme when the need arises. You can also hang chandeliers and pendants from the track. Track fixtures are available in standard or low-voltage current, with a choice of incandescent light bulbs, tungsten-halogen light bulbs, and energy-efficient compact fluorescent and LED bulbs. 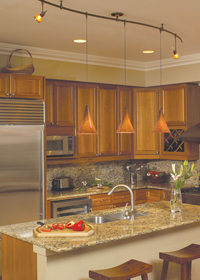 Kitchen and bath pendant lights are suspended from the ceiling over sinks, dinette tables, game tables, kitchen counters, or other work areas. Choose from standard, incandescent, xenon, halogen, LED, indirect or direct lighting with shades or globes to avoid glare. Adding a dimmer control to the pendant gives you the flexibility to vary the light to suit the occasion. Mini lighting pendants have also become very popular for providing good lighting and bringing the rest of the room together. A large kitchen ceiling lighting fixture, equipped with energy-efficient fluorescent tubes, supplies plenty of well-diffused general lighting, but it may leave you working in your own shadow at the sink, range, and counter tops. These areas need supplemental task lighting. For example, two track lights or recessed lighting over the sink will provide the illumination you need for brushing your teeth or washing dishes.